Prominent & Leading Wholesaler from Hyderabad, we offer air flushing sealing machine, continuous band sealing machine, heavy duty sealing machine, foot operated sealing machine, meal tray sealing machine and cup sealing machine. In order to cater the diversified demands of our clients, we have been able to provide a unique range of Air Flushing Sealing Machine. We provide the wide range of Continuous Band Sealing Machine. With the objective of providing quality Continuous Band Sealer Machine, we are progressing the industry as the professional supplier. 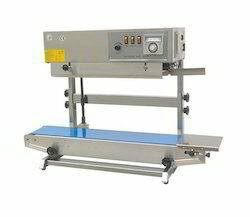 In addition, Continuous Band Sealer has the sealing width range of 8 to 10 mm, and the film's thickness is 0.08 mm. Adding on, this sealing machinery is very easy to install and maintain. 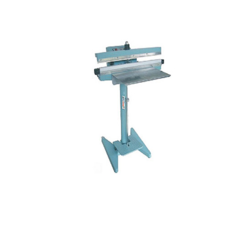 Our equipment is used in various sectors such as printing, sugar, textile, paper mills and others. These are designed from high technology and latest machines and tools as per the international quality norms. Backed with a fully fledged fabrication plant, we have been persistently meeting the demands of band sealers. We have a team of highly competent and experienced professionals having vast expertise in the domain of sealing equipment. With their skills, talent, and dedication, we are meeting the needs of our clients. 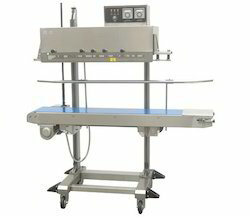 SPCS 900 Continuous band sealer can seal plastic films made from various materials continuously. Constant temperature control and the temperature is adjustable. SPCS 900 continuous band sealer is suitable for sealing small package in foodstuffs, general merchandise, medicine, spices, seeds and chemical industries. We are a unique name in the industry to provide our prestigious clients with an exclusive range of Heavy Duty Sealing Machine. 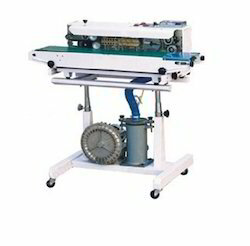 We offer the wide range of Foot Operated Sealing Machine. Foot sealers are widely applied to seal all kinds of plastics films, compound films and aluminum- plastic film. 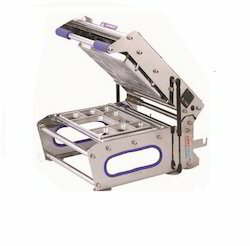 As a quality driven enterprise, we are engaged in providing a beautiful range of Meal Tray Sealing Machine. 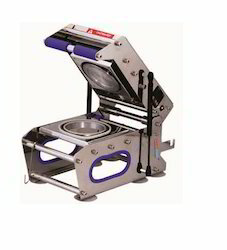 Keeping in sync with the latest trends, we are engaged in providing a trendy array of Cup Sealing Machine.